Today I finalized the annual Search & Find game for the grand kids. Every year it’s something different. 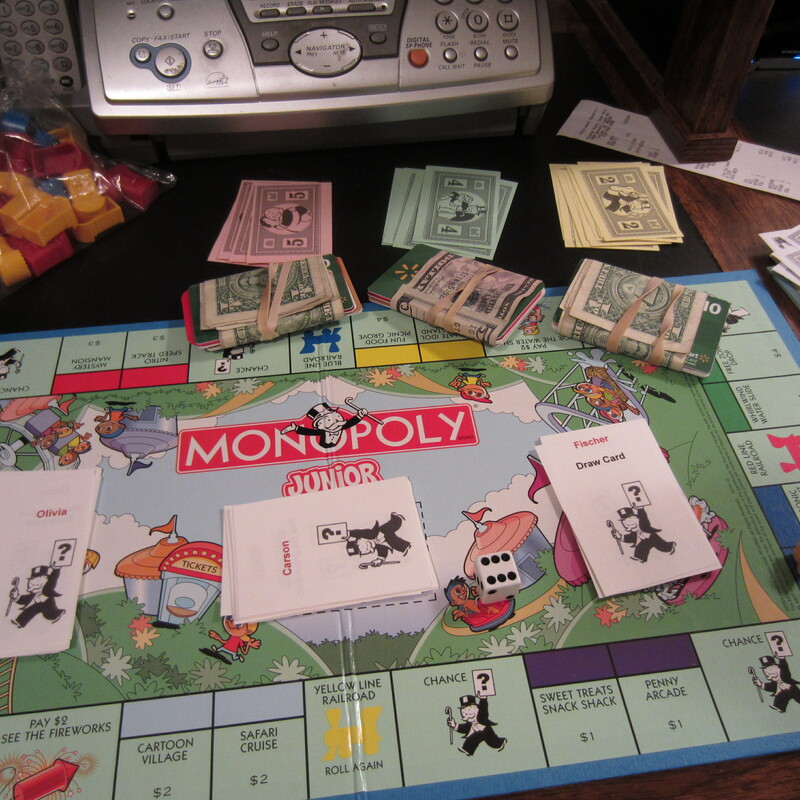 This year, we are playing a “revised” version of Junior Monopoly. Here’s how it works. I buy gifts card every holiday season for my grand kids ($5- $10 cards). These are hidden in various locations around my home. They love it! This year, I printed my own CHANCE cards to replace those in the Monopoly game. Each child has eight CHANCE cards with their names printed on one side and the prize location noted on the other side. The die is rolled and the tokens moved around the game board. A CHANCE card is received when landing on a spot that reads “Railroad, Lunch, Chance, or Free Space. If landing on property, the bank awards monopoly money for the purchase price of the property. Passing GO, earns them $2. The first person to remove their stack of CHANCE cards ends the game. Each player adds up their cash. A $2 fee is paid to the bank to purchase unearned CHANCE cards. Behind the paper towel holder is a $5 gift card to Subway. The kids love racing around the house looking for their prizes. Prizes this year are various $5 gift cards. I purchased inexpensive credit card holders for the kids to store their gift cards.